Remove the water and flesh from the coconut and set aside. Reserve shell. Heat a wok and add all the ingredients except prawns and seasoning. Fry briefly without oil for 30 seconds. Add in the prawns and tom yum paste. Toss, and fry briskly. Pour in coconut water and add the remaining seasoning ingredients. Bring to a boil until prawns are cooked, about 1 minute. 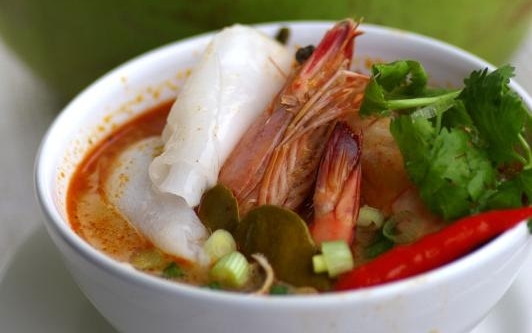 To serve, transfer the prawns together with the soup into the coconut shell and add in the reserved coconut flesh. Garnish with coriander leaves.